When choosing a canary nest for your breeding canaries consider your options, nest placement, and use of nesting materials. Canaries use the open bowl-shaped nest rather than the "enclosed-only-one-small-hole-open-on-the-side" nest. In the world of canary bird nests you primarily have 4 choices in construction materials...Bamboo, Sticks, Plastic, and Metal. I have used both bamboo and plastic but have not had the opportunity to try metal or stick. My assumption is that if my canaries were to choose, they would choose the one that is most like the nests built by wild canaries in the Canary Islands and that is the stick or bamboo nests. The plastic nest, however, is much easier to clean than bamboo and will last a lot longer. And cleanliness is important. The hen and babies will poop in and around the edges of the nest. Keep it clean and keep your birds healthy. It may cost you a little more than the bamboo nest but you will save money in the long run. Place the nest in the cage, attached to the bars, but make sure it is not directly under a perch or near a feeding or water dish. Your canary bird hen will appreciate a little space of her own. If possible place the nest toward the top of the cage near a corner. She will feel safest here. Be careful...don't place the canary nest so high she can't enter and exit easily. Keep the top of the nest at least 4 inches from the top of the cage. This will give her room to go in and out and also enough room to stand up and turn around in the nest. Obviously, if she looks like she is crowded against the top of the cage move the nest down a bit. Make sure the canary nest is secure and level. The last thing you want is to have your baby canaries falling to the floor of the cage. When using gunny sack, cut it into 2 inch squares and pull out the individual strings. Place in the cage. ...even if you have no intention of breeding canaries I suggest providing nesting material of some kind in the cage so your canary bird has something to play with. Canaries like to pick things up and carry it around so it's just another part of providing good canary care and making sure your bird doesn't get bored. Of course, cutting up nesting materials can be time consuming for you. Thankfully online stores usually carry nests and prepared nesting materials. Provide 2 nests per pair of breeding canaries. Before the first chicks leave the nest the female will begin a new 2nd nest. Feed your canaries well during breeding time. The hen especially needs lots of nutrients to avoid illness and to produce eggs and care for the babies. Keep in touch by signing up for the free CanaryTips newsletter. 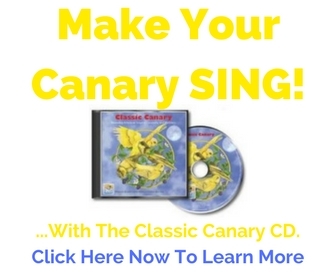 Return from Canary Nest to Breeding Canaries Main Page.